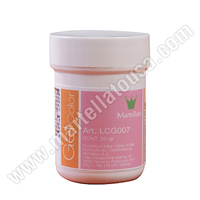 Highly concentrated gel for coloring sugar paste, fat masses and royal icing. Thanks to its concentration this product allows you to save color and to decide your own shade for your creations. DO NOT USE WITH CHOCOLATE. FDA APPROVED. Colouring composed of cocoa butter, once melted by double boiler or in the microwave, is perfect for colouring chocolate products.